Note: President Trump has signed a second executive order against Muslims and refugees. More analysis coming Friday in our legislative update. Salaams! February was an incredibly busy month for Poligon, as it was for many of you actively engaging in your communities. Take a look at what we've been up to and what's in store for March! Details: 6:30 – 9:30pm in Washington, D.C.
Poligon will be joining professional organizers to teach the basics of channeling personal experiences into practical action steps in your community. Come prepared to draw from your experiences, recognize your relationships, and realize your power. While the event is tailored for organizing within Muslim communities, allies are always welcome! Click the link to learn more. In District Week kept us focused on making sure our voice is heard in Congress, both in our home districts and in D.C. To help communities overcome the intimidation and lack of familiarity around Congressional engagement, Poligon put together a handy guide on how to set up an office visit and participate in a town hall meeting. ​Our first Legislative Update was released as well. "Hill Happenings" arrives weekly in your inbox with all the latest news from Congress that affects American Muslims. Make sure you're signed up! Poligon joined as a supporter of theFreedom of Religion Act introduced in the House of Representatives by Rep. Don Beyer (D-VA. The legislation was a response to the "Muslim Ban" executive order and seeks to halt the discriminatory act of profiling immigrants, refugees, and international visitors entering the U.S. based on religion. ​Poligon president and co-founder, Wardah Khalid, delivered a lecture on Overcoming Anti-Muslim Bias in the Workplace at Texas A&M University. Wardah discussed her work with Poligon and how allies can help stand up against Islamophobia. The event is part of an ongoing diversity-focused lecture series at the Mays Business School. Yes, the new President certainly has been busy since he took office, but so have we. 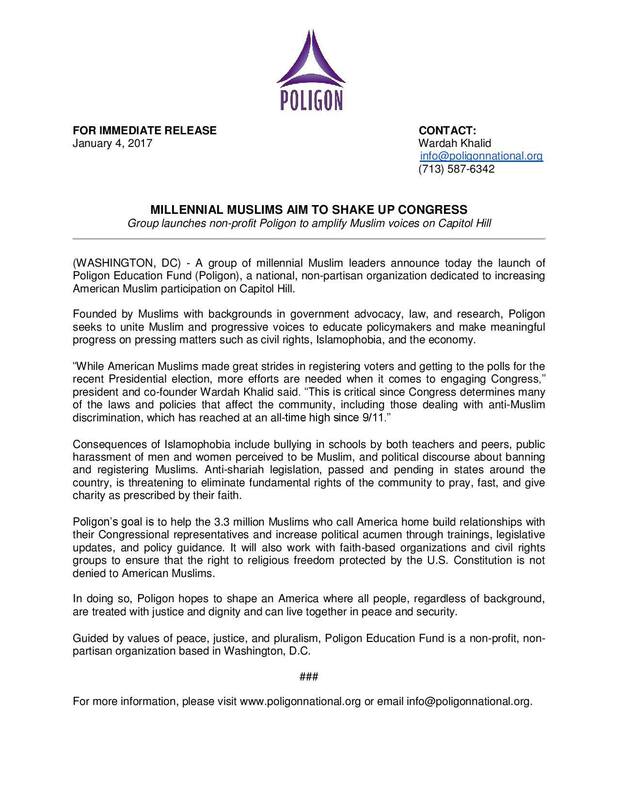 Since our launch, Poligon represented as an official partner at the Women's March, spoke out against Trump's Executive Orders (#NoBanNoWall) on international television, and was featured in theWashington Post. After attending Jeff Sessions' controversial Senate confirmation hearing, Co-Founder and President Wardah Khalid penned a piece in the Huffington Post about how it actually strengthened her resolve to increase Muslim political participation. Another source of motivation? The overwhelming support we've received from the community. Many of you visited our website, liked our Facebook page, and donated to our cause. Some, moved by our mission and vision, offered to serve as grassroots organizers in their hometown while others applied to volunteer or intern with us. We are truly grateful! Currently, we are in the process of interviewing interns and fellows, applying for grants, and collecting donations in order to hire staff. In the coming months, we aim to begin sending out weekly legislative updates and regular action alerts on issues you care about, offer trainings on best practices for Congressional engagement, and obtain specialized software to help you connect with your representatives quickly and easily. For all you social media fiends, our Instagram and Twitter is up and running :) Feel free to forward this newsletter to others and don't forget to donate!